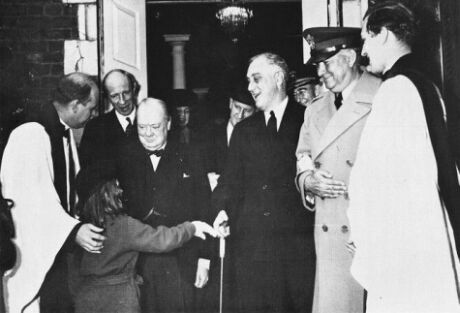 LHowever, Katrina was telling everyone, “I met Mrs. Roosevelt on my birthday!” Mrs. Roosevelt is just behind Churchill. This young feminist picked the winner out of the pack she met on January first! However, as the daughter, grand-daughter, and great-granddaughter of traditional-minded Anglo-Catholic priests and bishops, she accepted the fact that if she had been a boy she would have become a priest. But as a woman, she planned to be a social worker. Working in Botswana, Africa, Katrina, her husband George, and their sons Olof and William often stayed with Mrs. Lekgaba, a businesswoman and church leader when the Swansons visited Sabinas. Mrs. Lekgaba came from a clerical family like Katrina: Her father and brother were priests in Rhodesia. She ran a fleet of large British lorries which moved passengers and goods throughout her district on the edge of the Kalahari Desert. Although she was the de facto pastor and leader of the Anglican congregation in her town, the Anglican Church would not allow women to lead any public worship. They had to hire abusive, alcoholic men to lead their prayer services. After returning home, Katrina began to see that God must want women to be priests, as well as men. She told him that she believed she had a vocation to the priesthood. Katrina had no idea how he would receive the news. He had been a leader among traditional clergy and laity who defeated the proposed merger with the Presbyterian Church in the 1940s. His grandfather, the first Bishop Edward Randolph Welles, had encouraged the building of cathedrals across the country, welcomed Episcopal monks and nuns, and helped write the Chicago Lambeth Quadrilateral defining traditional Episcopal and Anglican requirements for any future church unions. Her father surprised her by saying he had approved of women’s ordination since reading “Women and Holy Orders” by Charles Raven in 1928. Katrina and George republished Raven’s book in 1975. One of the “Philadelphia Eleven,” Katrina and her father helped organize the 1974 irregular ordination of the first eleven women priests in the Episcopal Church USA. (The first women priests in modern times were ordained in Hong Kong: Florence Lee Tim Oi in 1944 and Jane Hwang and Joyce Bennett in 1971.) Katrina’s seventeen-year bi-lingual ministry as rector of St. John’s Parish in Union City, New Jersey, was an uphill struggle filled with love. She celebrated the Eucharist bilingually in Spanish and English and founded and led a bilingual afterschool program for over a hundred children ages 5 to 18. She served on the board of a hospital and a homeless shelter. Katrina retired to Manset, Maine in 1996. After being diagnosed with inoperable colonic cancer Katrina was cared for by Hospice at home in Manset during her sixteen month illness. She looked forward to the other side of death. “A Town Like Alice” by Nevil Shute, “Black Elk Speaks” by John Neihardt, “Man’s Search for Meaning” by Victor Frankl, “The Healing Light” by Agnes Sanford, “The Hiding Place” by Corrie ten Boom, “The House of Prayer” by Florence Converse, “The Power and the Glory” by Graham Greene, and “The White Witch” by Elizabeth Goudge. In the year before her death Katrina and her daughter-in-law, Helene Patricia nee Carpenter de Boissiere-Swanson, spoke often about the absence of women’s rights under U.S. law. Like Alice Paul Katrina and Helene knew women’s rights would only be realized in U.S. law by amending the constitution. Katrina died peacefully while a hurricane bearing her name was showing Americans how much liberty and justice poor folk had in New Orleans and in America. She had learned this years before. When the Equal Rights Amendment failed to pass, Katrina realized that she was a second class citizen like every other woman in America. Justice was important in her family. Her great great uncle had been run out of antebellum Vicksburg for preaching abolition. Her grandfather founded an inner city mission in Cincinnati and was later run out of Chelsea, Oklahoma for giving Holy Communion to a Black priest at the altar rail. Helene de Boissiere-Swanson, William Gaines Swanson and George Gaines Swanson founded KatrinasDream.org to carry on Katrina’s dream of seeing the rights of women upheld by the law. Katrina’s family and friends held a Weekend for Liberty and Justice, July 27-30, 2006, ending with her burial near a bench given in her memory at St. Saviour’s Parish in Bar Harbor, Maine. 1) Just Words? Language at Worship that includes both women and men articles by, The Rev. Kathryn Piccard. Kathryn may be reached at kapiccard[at]comcast[dot]net. 2) Liberty and Justice for Indigenous Women Sea to Shining Sea and article by Diana Ramsdell Newman. Diana is social justice activist living in the state of Maine . Diana may be reached at redwingway[at]yahoo[dot]com. Your comments are welcome on the Dreamscape which dreams about the liberty and Justice which God has in mind for the whole world. We’d love to hear from you. You may email us at the addresses below. Surely the dear G-d is always with and within you now and forever. Click here for the text of Katrina’s Funeral mass, led by The honorable Rev. Emily Hewitt, the Rev. Merrill Bittner, the Rev. Alison Cheek and the Rev. Carter Heyward and by the Right Rev. Chilton Knudsen, the Episcopal Bishop of Maine. Click here to see the Bangor Daily News article.